Incoming Virgin Australia chief executive Paul Scurrah says he already has ideas about what he wants to do at Australia’s second-biggest airline but they will be informed by feedback from within the business. The newly-minted chief executive said his first priority would be getting out and meeting staff. “I clearly come into the role with some ideas about what it is I would like to do,’’ he told reporters Wednesday. Virgin confirmed yesterday that Scurrah would take over from incumbent John Borghetti on March 25 after a global search generated keen interest from Australia and overseas. READ: Scurrah confirmed as next Virgin CEO. Scurrah, who was most recently the CEO of DP World and will split his time between Brisbane and Sydney, has worked for almost three decades in airline, tourism, transport, freight and logistics businesses. He noted there were close parallels between logistics and aviation in that both were intensive operations requiring a capital-intensive fleet to deliver to the customer. There were also strong regulatory interests, big workforces, active union involvement and shareholders who required a return on investment. “I’ve been transporting people and cargo for a very long time,’’ he said. “At Queensland Rail, we carried around 60 million passengers. At Aurizon we moved 190 million tonnes of coal while at DP World we moved two million containers around the country. However, he agreed he would have big shoes to fill given that predecessors Brett Godfrey and Borghetti had both wrought significant changes on the Australian aviation landscape. “So yes, it is somewhat daunting,’’ he said. “In terms of my own ambitions coming in as CEO, it goes back to what I was actually saying before. I will focus on things that are related to the performance of our staff, the culture that they operate in and their ability to thrive. “I actually believe — and this is very aligned to Richard Branson’s philosophy anyway — that if they’re happy then our customers are happy. Scurrah praised Borghetti for making Virgin a strong competitor to Qantas but would not be drawn on whether a priority would be to increase the airline’s market share. He said he was walking into an industry where there were strong and healthy competitors on both sides. “I intend to continue to compete but I want to do all of that with the priorities in mind that I’ve already mentioned and making sure there’s a very strong focus on delivering a healthy bottom line and return on investment for our shareholders,” he said. On increasing international routes, he joked that Borghetti had suggested Rome as a potential destination but it was early days and he intended to speak to people within Virgin about every aspect of the business. “I do think it’s important, though, that we attempt to compete across all of the sectors of the airline and aviation industry in this country,’’ he said. 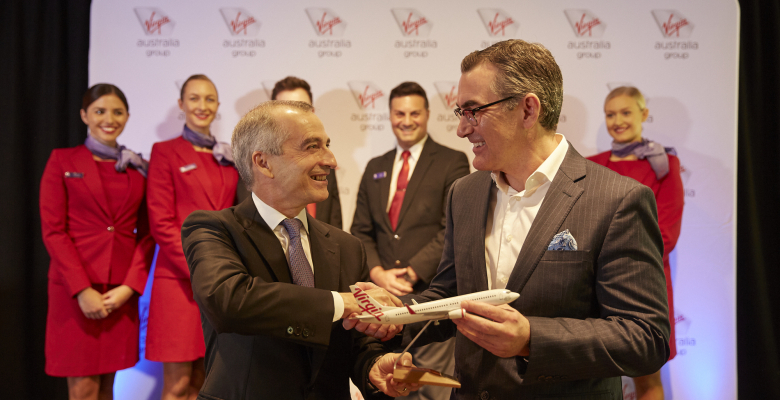 Asked what he regarded as his biggest achievement during his time at Virgin’s helm, Borghetti said it was his pride in Virgin staff for converting the airline to a full-service carrier and “transforming the aviation landscape in this country”. He said the people in Virgin had been able to do what no other airline in Australia, and arguably the world, had been able to do. “And that’s an enormous sense of pride for me, that 10,000 people – 6000 when I started – have been able to achieve that,’’ he said.